Red Valve manufactures a range of slip-on expansion joints to suit special low-pressure applications where a quick installation is important. The SL-50 Expansion Joint is designed to be quickly installed onto standard Schedule 40 pipe. The SL-50 uses slip-on connections with stainless steel mounting bands for a secure connection. The SL-50 features an inner tube that is chosen to be compatible with the process material, a middle layer containing fabric and wire reinforcement, and an outer layer to protect the joint from occasional contact with oils, corrosion, and weathering. The SL-50 can be constructed in custom lengths, with custom cuff I.D.’s and in custom configurations. 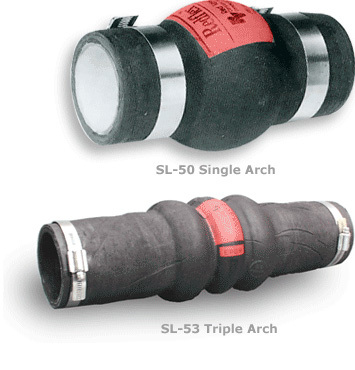 The Slip-On Series SL-53 Triple Arch Expansion Joints are designed to allow for greater contraction, expansion, and lateral movement than the SL-50. The internal diameter of the SL-53 is equal to the outside diameter of replacement pipes. The SL-53 slips over the ends of an open pipe and is secured by clamps. Construction consists of a tube made of natural or synthetic rubber, a hand fabricated body consisting of high quality synthetic fabric for reinforcement, and a cover wrap used to protect the unit against occasional contact with oil, weathering, ozone, and corrosives. The SL-53 Triple Arch Expansion Joint is simple and economical to use. The SL-53 Expansion Joint will absorb movement from vibration, thermal expansion and contraction, and allow for misalignment of piping.